Post 400 at last. I feel I’ve created a large enough body of work that there’s a little something here for most everyone. Like a hefty living cookbook that embodies my blood, sweat, tears and soul. Slowly over the past few months I’ve been weaning myself out of the blogging system by pulling out of clubs and websites, leaving cooking groups and discontinuing participation in blog stuffs preparing for this day. I admit I’m anxious and not just a little scared to fly away from this project. This has been my life for years. It’s habit now that absorbs huge amounts of my time and emotional energy. It’s also my comfort and my way to express myself through food, photographs and words. Which is why I can’t just let it go or leave completely. So this isn’t goodbye, but I’m taking a long overdue break from food blogging for a while. Oh, I’ll likely still pop on now and then when a recipe or story gets me excited and I’ll still take on special assignments, but I’m ready to start and finish a few nonfood projects I haven’t had time to work on. This break is not something I take on lightly. Emotionally I’m tied to this body of work, as it’s the first time every creative process was my own. If I got an assignment, it was because I picked it. My own thoughts, visions and subjective views are all here. I’m intensely private by nature, but tried hard to put as much me in here as possible. It wasn’t always exciting, but it was always me. However, I have a novel that's partially finished I’ve been promising myself I would tackle head on. I’m looking forward to much more writing time. I’m also gearing up to start a new trade I trained for and that job starts Tuesday. There will be a learning curve but I’m pretty excited and I get to work for a woman I sincerely admire. I admit another reason for this break is I miss cooking freely without having to test and write everything down. Just fly by the seat of my pants kind of cooking. Doesn’t that sound nice? Plus I’ve been wanting to cook and taste other food blogger recipes and I can’t do that while I’m posting myself. It’s going to be fun! Will you guys ever forgive me? I'll still be here, but I’ve turned the comment moderation on, as I won’t be checking this everyday. If you want to get a hold of me, add me to Facebook or shoot me an email please. Facebook is great as I’m always connected. I also want to say thank-you, for everything over the years. Yeah I know I’m not capable of really leaving, but still, thanks. This idea for a food blog started more than four years ago when a group of MySpace friends and I took pictures of our meals and posted the recipes for each other. I’m still super close to those ladies and our inclusive group has grown into something wonderfully huge. Plus we have big girl blogs now and switched out MySpace for Facebook, which has been fun. And after all these food blogging years holy crow do I need to go on a diet! Trust me, you don’t want to be around for all that boring food. So here is that last recipe for a while. I thought I’d end with something wonderfully indulgent and an old time classic because tomorrow it’s lettuce for me! This decadent recipe was submitted by Behr to Allrecipes.com and I think it’s probably the best Chicken Cordon Bleu I’ve ever had. 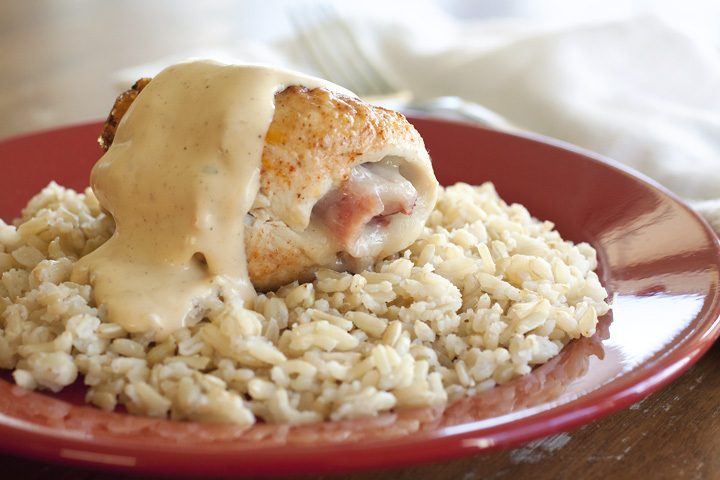 Behr writes that it’s "The standard Cordon Bleu swimming in a creamy wine sauce." Sure it is, if standard means I’ve died and gone to heaven. 1. Pound chicken breasts if they are too thick. Place a cheese and ham slice on each breast within 1/2 inch of the edges. Fold the edges of the chicken over the filling, and secure with toothpicks. Mix the flour and paprika in a small bowl, and coat the chicken pieces. 2. Heat the butter in a large skillet over medium-high heat, and cook the chicken until browned on all sides. Add the wine and bouillon. Reduce heat to low, cover, and simmer for 30 minutes, until chicken is no longer pink and juices run clear. Recipe submitted by Behr to Allrecipes.com. Picture by Laura Flowers.